Choosing a camping product is really a challenge for most and if you are looking for the best camping grill, I know you understand what I mean. Choosing a camping grill is getting more challenging with the fact that there are a lot of options now in the market; from the size to the weight to the kind of fuel it uses to work. Why settle with a camping grill? Most backpackers and campers will go for a camping stove than a camping grill but what we don’t know is that a camping grill is a lot better to use outdoors. For once, camping grills are easier to clean, less bulky and provides more consistent heat than a stove. Modern camping grills are now using propane while there are some that is designed to use woods when grilling. For seasoned campers of course, buying a camping grill can be just an additional cost because they can just use two big rocks and some screen for their grilling needs (which can lead to fire if done incorrectly and irresponsibly). For a more responsible camping though and to avoid leaving burned grasses, use a camping grill for your grilling needs or a stove for your cooking needs. Here are the top 7 highest rated camping grills that you can find in the market today. For the best camp grill from Weber, the 54040001 Q2200 Liquid Propane Grill is one grill worth having. Camping is not all about appreciating nature and challenging ourselves to overcome obstacles and outdoor life challenges, it is also about eating good food while away from the city and the only way to do it is with a camp grill. With the 54040001 Q2200 Liquid Propane Grill, you can now enjoy a sumptuous meal even if you are far from home. This grill is a single stove burner that can do 12,000 BTU-per-hour. It means it can heat a total of 280 square-inches. This camp grill is made of porcelain enameled cast-iron cooking grates. Some parts are also made of aluminum like the body and the lids. This camp grill is ready to use once out of the box and comes with easy start ignition system. It is best to use it with a 14.1 or 16.4 oz. LP cylinder. The Weber 54040001 Q2200 Liquid Propane Grill has a price tag of less than $700. It features larger handle grip, ergonomic side handles, durable cradles in front and on its rear, control knobs, and a lid. With this grill, you can now prepare your breakfast, lunch and dinner with ease regardless of how many there are in your group. This camp grill has a dimension of 26 x 25.1 x 51.4 inches and it weighs 38.5 pounds. Unless you are hiking with someone strong who can carry it, then it is a great grill to have in your camping and other outdoor activities. For its price and performance, this best camping grill from Weber is a great buy for any camping enthusiasts out there. 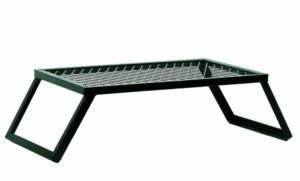 The Heavy Duty over Fire Camp Grill is the best grill for camping from Texsport. This camping grill has a tag price that starts at $15 to $100 depending on its size. The design of this camp grill is very simple and there are only three sizes you can choose from; medium, large and extra-large (16L x 12W x 6.75H, 24L x 16W x 8.25H and 36L x 18W x 8.75H inches). 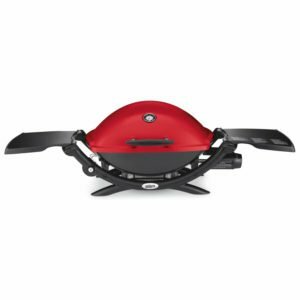 The Texsport Heavy Duty over Fire Camp Grill is a heavy duty foldable steel designed to look like a grill. The top is made of steel-mesh for added support. This camp grill might look simple but it can hold large pans and pots even those that are made of iron. The legs of this grill are foldable so it can be carried and transported easily. The regular weight of this camp grill is just 7 pounds. To be honest, although it doesn’t have a lid, I can say that this simple camp grill is the best camping grill out there that any camper should bring and use for their cooking needs. Coleman is a known outdoor products provider and when it comes to the best portable camp grill that Coleman can offer, they have the Coleman Road Trip Propane Portable Grill. This portable camp grill has a price tag of just over a hundred dollar. Although it is a camp grill, it comes with different cooktops that user can interchange depending on the type of food being cooked. This camp grill also feature Instastart ignition hence a push of the button is enough to light it up, there is no need to bring a match or a lighter anymore. With PerfectFlow technology that all Coleman camp stove comes with, you can be sure now that your camp grill will work regardless of the weather condition you are in. This grill might look big but no worries, for easy transport, you can just have its legs collapse on its own. What I like the most about this camp grill set is the fact that it is very easy to clean. This set is made of cast-iron and porcelain-coated surfaces with removable grease tray and all it takes is less than 5 minutes to wipe it clean. This camp grill has a dimension of 19.13 x 13.5 x 33.75 inches and weighs 48.5 pounds. 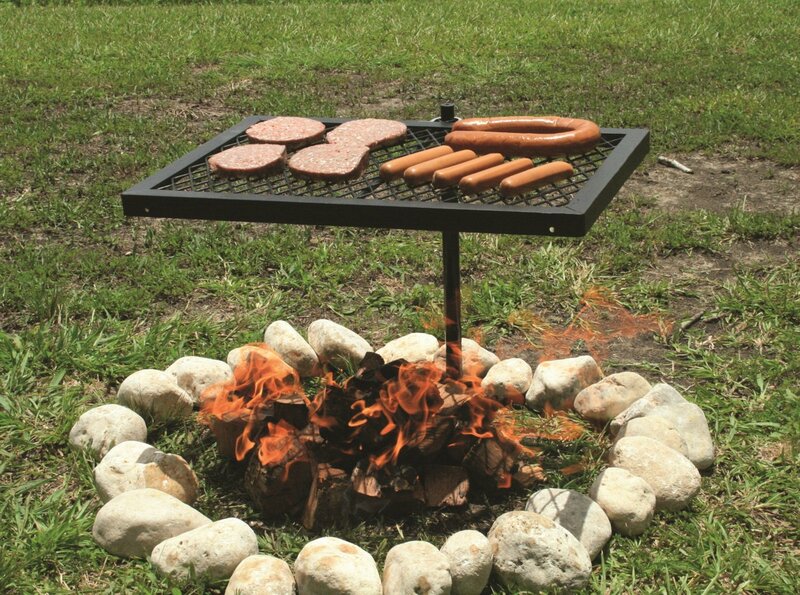 For garden parties and beach camping, this is one great camp grill to have. 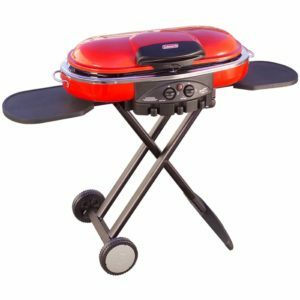 What is the best camping grill from Coleman for campers who don’t really want to spend on a camping grill? I would recommend the less than $20 Coleman Deluxe Camp Grill! This camp grill is very easy to set up and very easy to use. It is a foldable grill with a dimension of 24 x 12 x 0.6 inches. It is 6.3 inches tall. 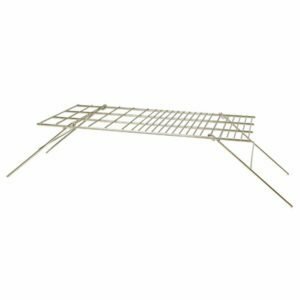 This camp grill is made of nickel plated steel and when not in use, you can just fold it flat and put it in your backpack for easier transportation. The Coleman Deluxe Camp Grill only weighs 3.1 pounds. What is the best camping grill that you can get for as low as $100? 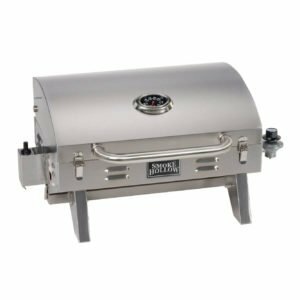 The Smoke Hollow 205 Stainless Steel Tabletop LP Gas Grill is a good choice for a camp grill if your budget is just $100. This grill can heat up to 305 square inches of surface with a 12,000 BTU Stainless Steel “U” Burner. The legs of this camp grill are foldable for easier transport and portability and it comes with locking hood as well. This is a stainless grill and it has a dimension of 16.5 x 12.25 x 26.5 inches. It weighs less than 20 pounds so if you are planning to do long hike, this might not be a good choice to have. This grill is highly recommended though if you are planning to do camping nearby where there is a car park so you won’t have to be carrying this manually. Since it is made of stainless steel, users are guaranteed with highly durable product. It uses propane as fuel which is not included on this package. 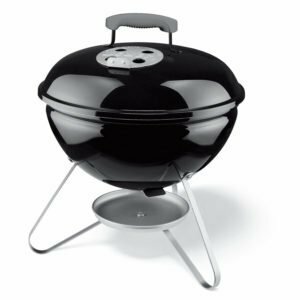 If you are in a tight budget but you want the best camping grill that your money can get, you can have the Weber 10020 Smokey Joe 14-Inch Portable Grill. This camp grill costs less than $30 and is available in different colors. This charcoal camp grill can be used for different kinds of outdoor activities like during cookouts, if you are having car camping and tailgate parties. It has a lid that can be removed by holding the glass reinforced nylon handle. For the cooking grate, this camp grill has a 14-1/2-inch diameter one and it is a triple nickel-plated. What I love about this camp grill is the porcelain enameled coating that protects the grill from rust and fading. From Weber, this camp stove is backed up by a ten year warranty. The Weber 10020 Smokey Joe 14-Inch Portable Grill has a dimension of 15.6 x 15.6 x 9 inches and weighs 9.5 pounds. With this best camping grill from Weber, there is no reason for anyone to pack ready to eat meals anymore when every camper can enjoy hot meals anywhere they go. One of the best camping grills that we have has a price tag of just below $10. 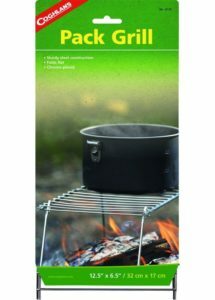 This is the most practical and easy to use camp grill for me, just like a regular grill that you can find at home, simple design for simple use. The Coghlans 8770 Pack Grill is made of chrome plated steel and is made in China. The steel used on this grill is heavy duty and assures users that it is of sturdy construction. For easy storage, the legs of this grill can be fold and flattened. The surface of this grill has a dimension of 12-1/2″ x 6-1/2″ (32 x 17 cm) so you can now grill some meat or cook some soup while waiting for your teammates to set-up your tents. There are two basic things that I often check when accompanying a friend buying a camp grill; first is if it comes with a lid and the size. The lid will help in controlling the heat of the grill, allowing it to cook meat more steadily. The size is also important because it should be large enough to allow you to make it a two cooking zone. This will not just make cooking faster, it will also help in reducing gas consumption. The top camping grill is also the one that uses less fuel and based on personal experience, a propane powered camp grill is better as compared to charcoal powered camp grill.